Can we all agree that this looks like a late model race car? Like it should be sideways, sliding around a dirt short track somewhere? 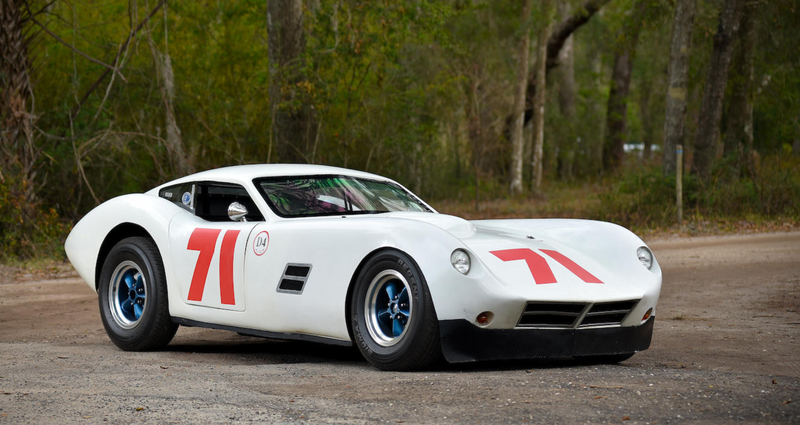 But it’s not, it’s a Kellison J4R, a fiberglass hot rod sold in the 1950s and 60s by Jim Kellison. Available as a kit or a ready-to-run complete car (which would’ve run you a pricey $6,700 in 1960), the J4 was available between about 1958 and sometime in the early 1960s. This one is powered by a 497 horsepower, 6.6-liter V-8 and was originally set up as a race car (the “R” denotes a lightweight racing body, as on this J5R). The current owner acquired this car in 2001 and wanted to be able to use it on the street, so he had it converted to a street-legal setup making it an awesome road and track car. The J4 was available as a Coupe or much rarer Roadster. About 300 examples of the Coupe were built and this one should sell for between $35,000-$55,000. Click here for more info and here for more from Bonhams. This entry was posted in Uncategorized and tagged 1959, auctions, Bonhams, cars, classic cars, coupe, j4r, kellison by classiccarweekly. Bookmark the permalink.